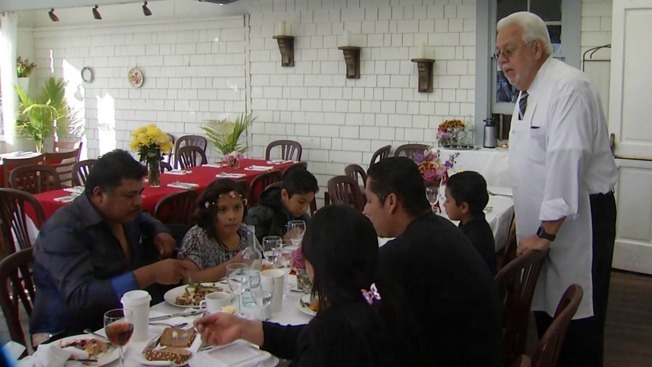 A waterfront restaurant in the East Bay wined and dined hundreds of families in need during a special Thanksgiving feast Thursday. Roughly 1,200 meals were dished out and hundreds of winter coats were distributed at Richmond's Salute e Vita restaurant thanks to the generosity of owner Menbe Aklilu, an immigrant from Ethiopia who was once homeless herself. "It's not only about the meal, it's about the experience," Aklilu said. "They feel good. At least today they feel special." Robert Walsh, who said he hasn't filled his stomach with a full meal in about one year and lives out of his car at the moment, was surprised by the bountiful feast. "When I was told about this, I was thinking maybe we were going to a shelter to eat," he said. "To see this and what (Aklilu) is doing here, it's a really good thing." Thursday's act of kindness wasn't just a treat for those needing a hot meal. It was a "thank you" from Aklilu. The restaurant owner's landlord threatened to evict her from the restaurant roughly four months ago because of maintenance issues, but thanks to community support, the eviction was rescinded. "Here, today, double celebration," Aklilu said. "The workers are happy and we are giving back to the community, which is the community that stood for me."